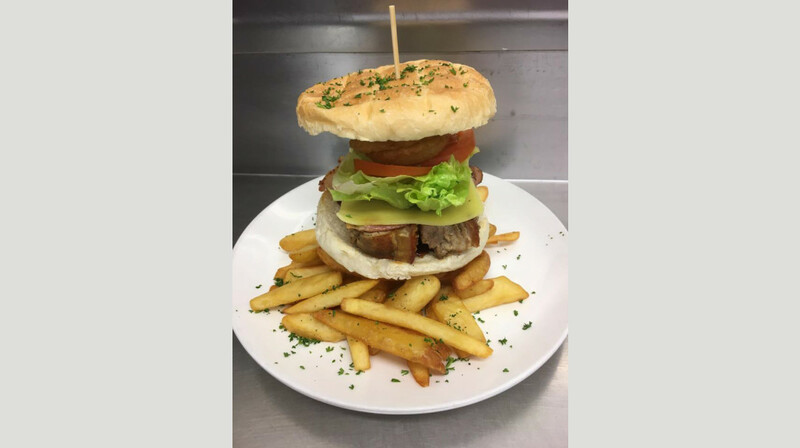 With its laid-back atmosphere, big screens, dependable food, cold drinks and friendly staff, The Brook Bar & Eatery is the perfect setting for watching the big game, an outing with the team, or celebrating auntie’s birthday. 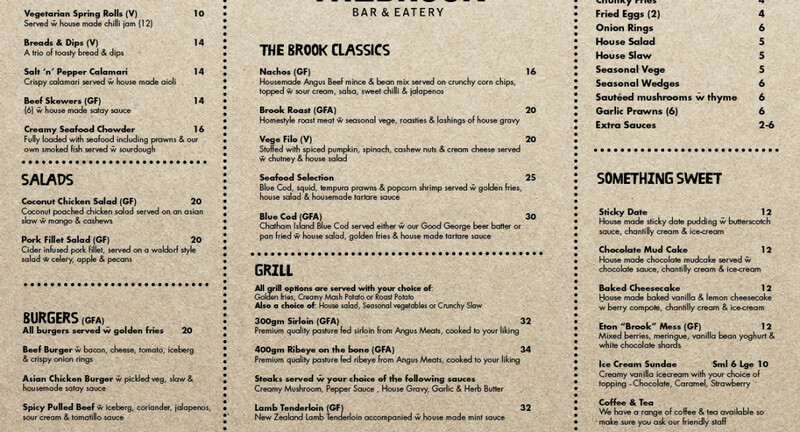 Whether you’re after a classic burger and chips or something fresh like coconut chicken salad, the team at The Brook is sure to sort you out. 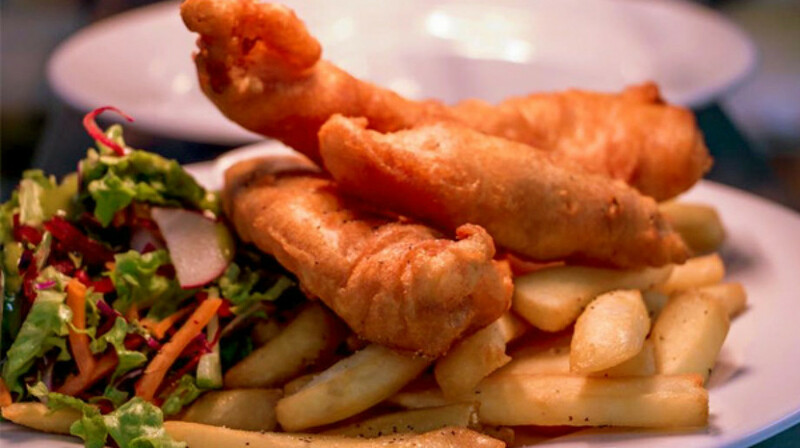 With a gluten-free and vegetarian-friendly menu, there’s something to suit everyone’s tastes. 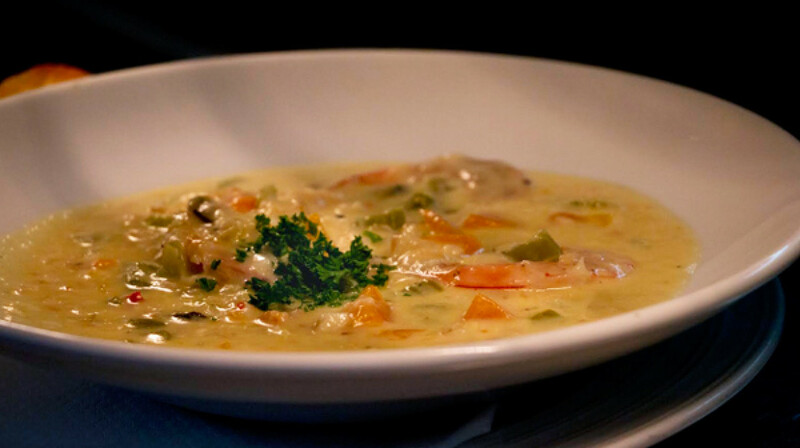 Come try the legendary seafood chowder and see what everyone’s on about! 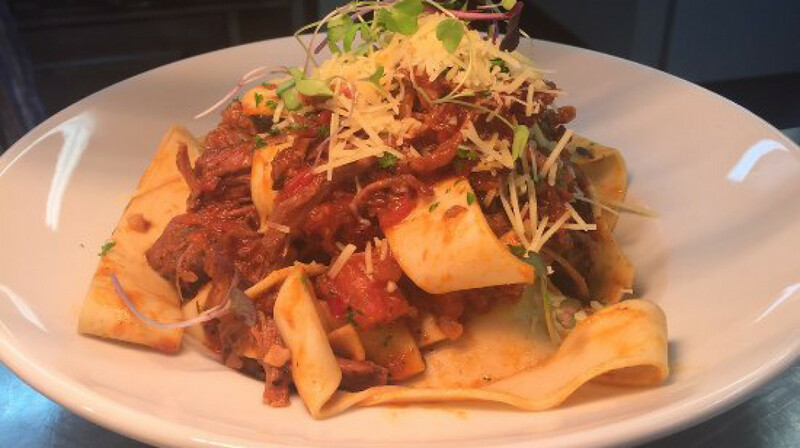 Dive into a satisfying plate of nachos and ice cold beer with the boys, then take the kids in for a lazy weekend lunch off the ‘Young Ones’ menu. 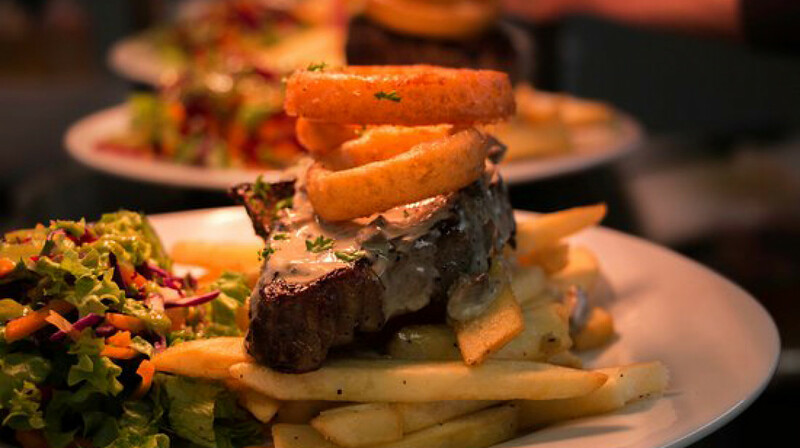 Enjoy a cheeky lunch with work mates and come back for a steak dinner with mum. 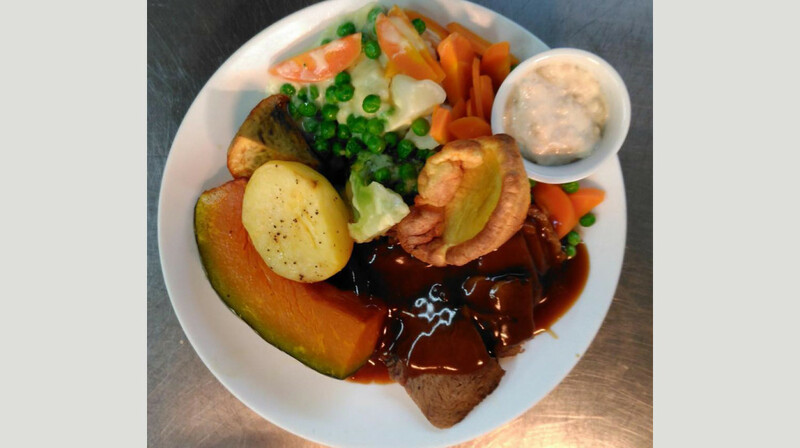 Good food and warm hospitality are always on offer at The Brook! Enjoyed the meal, good atmosphere. Excellent food, loved the calamari and beef skewers. Great service too! Fantastic staff, both our waitress and the bar lady were very friendly! Amazing food, very generous portions. Great dining! Generous portions of tasty food. Great atmosphere and very friendly, helpful staff. Very quick service, meals are really big so ladies take your meat eating husbands or children along they won't be disappointed. Very good value anytime. Lovely friendly staff and great meals for all plus plenty to entertain the kids . Only small negative was the meals were rather large for our appetites and disappointingly we were all to full for desert . Again it was still good kai. Had a fabulous meal out, and were snug near the gas fire. Staff were incredibly friendly and helpful. The food was fab. Lovely little bar nicely set up we got a table right by the fire as it was a very chilly night was the best seat of the house there is a large selection of food on the menu from snacks to HUGE dinners to desserts and even a kids menu the service was great very down to earth easy going casual place to dine and theres food for everyone u can have a plain steak to a steak with all the bells and whistles and I would have to say we paid $32 and that's for 2 HUGE meals 2 fizzy drinks and a garlic bread holy cow u couldn't do better we will be back!!!!! Enjoy the food and service. The Special was Oysters so we decided to try 1/2 doz as an entree knowing there was no discount. The serving turned out to be small meal with chips and salad. The one thing I forgot to ask was their origin, Bluff or Pacific. They were the least favoured Pacific oysters and a couple were quite gritty. From the time Jules greeted us, the meal and service were great. Jess gave us very good recommendations in regard to the meal options and it was so good to get a ribeye cooked to perfection, medium rare as requested and the Blue cod was perfection. The garlic bread starter and accompanying main dish salads and chips were A1 and served in very generous quantities. 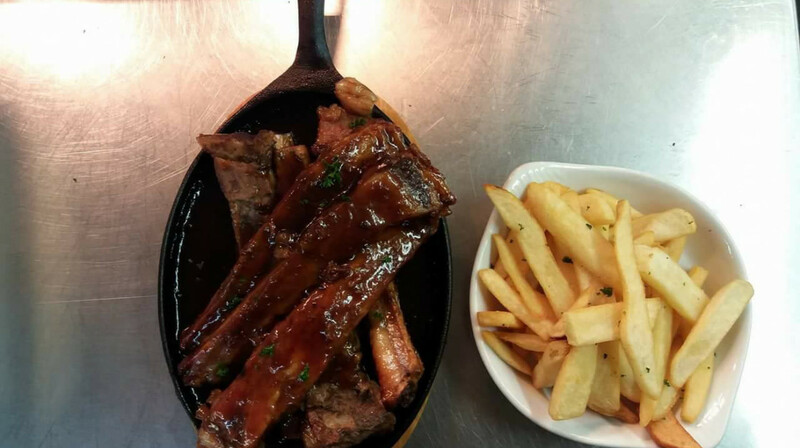 Based on the experience, both of us have been recommending to others and look forward to our next meal at The Brook. We came in and were directed to a table they had set up by the fire for us (since it was rainy and freezing) our drinks order was taken quickly and returned to us in a prompt manner. The staff were excellent in answering our questions and even double checked things with the chefs. We ordered a garlic bread for starters and steak mains which were all cooked to perfection (a blue, a rare and a medium rare) and the meals were of a huge size that we all had left overs. One of my dining companions is a chef and he was highly impressed with the plating and flavour that the meals and entrees had. Would definitely recommend and we will be going back. Not bad for a pub meal. The only criticism I have is the amount of salad on your plate, would be ok if you were a horse so a lot of wastage. Really enjoyed our main meals and service. The only minor comment the dips would have been nicer if made fresh. A real delight from start to finish. Very attentive and friendly staff, incredibly satisfying food, and a nice quiet atmosphere for talking. I can't wait to go back. I had the salmon with my chosen sides of coleslaw and mashed potato and it went together so well. The salty richness of the salmon with the creamy coleslaw and melt-in-your-mouth mashed potato was glorious. My companion had the steak on the bone with chips and coleslaw as his chosen sides and he was similarly impressed. The kids fish and chips also went down well. The fish seemed like good quality. And to top it off, an Emersons Pilsner on tap. Mmmm. We followed with a great coffee, and an Eatons Mess to share which was full of berries and really beautifully presented. Delicious meal, generous servings. Great atmosphere. great service however the food was average . Great food, large portions and cheap beer! We ate at the Brook last night. Excellent service, we enjoyed asking each other the trivial pursuit questions that are in a little pile on each table. The Eton mess was outstanding! Fantastic food. Couldn't eat it all. Awesome staff. We had allergies and they were super helpful. Would go back again for sure. Good food and service. Will return. Food was nicely presented, good amount of choices, service friendly would go again. We had a great time, the staff were very friendly and there was plenty of seating space. I had the mushroom sauce with my meal which was delish but I would have like a little bit more. we are definitely thinking of going back to try out some of the other meals. 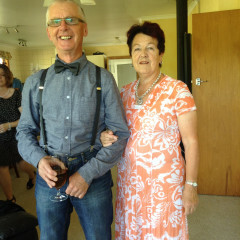 We had a visitor over from the UK who we had not seen for 45 years. We were so impressed with the food especially the Seafood chowder. Our waitress was also very attentive & friendly. We dined for my sons 10th birthday. When we arrived being a Friday night, the bar was really busy! We were quickly seated at our reserved table.... Our food and drinks came out fast. Can't fault the service! My husband and I had Blue Cod which was lovely. Children dined off the kids menu and surprisingly ate the lot! The kids got dessert and they even put a candle in my son's for his birthday which was a nice touch. We will be back! Food was great and service too. We will be going back again. Great atmosphere!!! Food was awesome and plentiful!! Highly recommend!! Tuesday night, very quiet, table right in front of gas fire, ideal to catch up with friends. Warm inviting atmosphere, great service by male host, very smiley and friendly, food was good and timely. Not an extensive menu but sufficient for choice. Will be back. Our waiter was very friendly and offered great service. Our meals were all very nice. Yes we would go again. 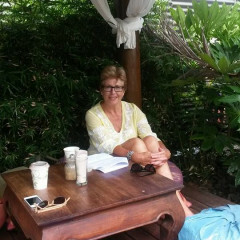 Lovely ambience, great service and friendly staff. 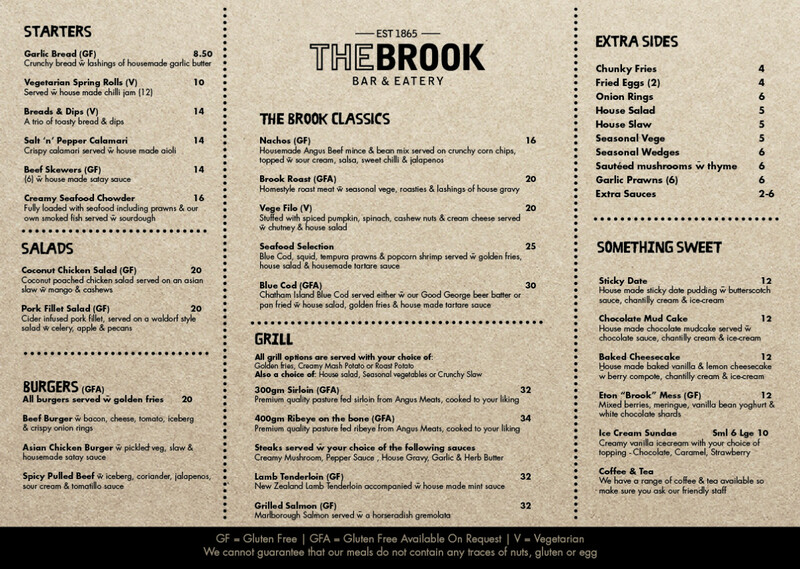 This is the second time I have dined at the Brook. Both times service was excellent. Served straight away and the waiter was friendly, enthusiastic and knew the menu and all specials of by heart. Entree came out quickly and very hot, we had vegetarian spring rolls with a chilli jam chutney. It was really nice. Mains came out quickly and were also delicious. Great portion sizes and no problems getting leftovers to take away. Tables are always clean which is great. Over all would rate the experience 10/10. Great restaurant and bar, great staff and great atmosphere. Will definitely be returning. Having been to the Brook once previously We were pleased to see a new placement on First Table. The food was great especially if you have a good appetite. Waitress was friendly and attentive.